I found this book to be a sweet and really profound moral tale. It involved Juniper…an only child who was once much loved by her parents. Juniper’s parents were once struggling actors who have finally become very famous and esteemed. They have won Emmys and Grammys and Oscars and have a huge mansion and adoring fans and everything they ever thought they wanted. Juniper is miserable. Her parents barely notice her or her dog, Kitty. She is often pushed aside, is home schooled by teachers who often don’t stay very long and has no friends. One endearing part of this tale was when Juniper realized she had never run in a race because she never had any one to run with. Juniper loves to look at things with her binoculars and telescopes and night time goggles. One evening, as she again puzzles over the extreme changes in her parents, she sees them both run into the forest behind her house. 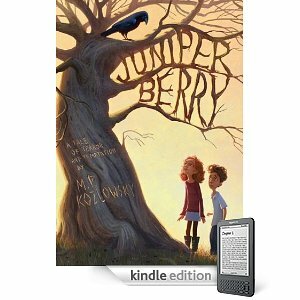 When they come out of the forest they act very differently so Juniper sets about trying to discover why. The next day, while exploring the forest, she meets Giles, a neighbor who is about her own age but very small, thin and fragile. Giles tells Juniper that he is often picked on and bullied at school. Giles also relates that his parents are acting the same way that Juniper’s parents are acting. This causes Juniper and Giles to team up to solve this puzzling awful mystery. Giles is also the person Juniper runs her first race with. This part was truly so sweet. Juniper is determined to find out what her parents are getting from the forest and this is where this story becomes a sort of good against evil fairytale. An evil horrible man needs the dreams of people to trick them into thinking they have everything they want. He has a balloon maker imprisoned in the tree who makes balloons that hold the dreams. People sort of exhale their breath into the balloons and this gives strength to the evil shrouded dream snatcher. Juniper has to be strong along with Giles to match wits against the dream stealer. That is all that I will say. It is worth reading…probably to or with a child…not a young child but perhaps second grade and on. It had scary bits but lots and lots of wholesome good bits. Juniper is a delightful character…strong, brave, sad, sweet…I was instantly championing her. I was wondering about this. Maybe I'll read it with my daughter.